Journeyman defensive lineman who played for eight different franchises over ten years in the NFL. His most successful season came in 2007 with the Cleveland Browns, racking up 48 tackles and two sacks in 11 starts. After playing two years at Butler Community College, he played his last two years of football at the University of South Carolina. 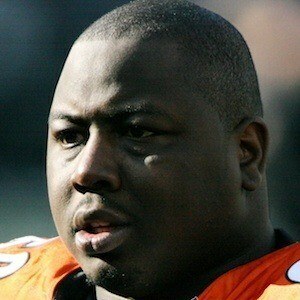 He signed with the Dallas Cowboys after going undrafted in 2003. He spent part of the 2009 seasons with Las Vegas Locomotives of the now-defunct United Football League. He scored a rushing touchdown, his only career touchdown, in 2010 with Kansas City. He has three children, all girls, named Autumn, Markaylon, and Kyrum. During his time with the Cleveland Browns, it was reported that he punched Brady Quinn during an altercation in the weight room. While he denied the reports, he was held out of the team's next game.